Florian Kamberi insists his dip in form for Hibs was caused by playing with an injury. The Swiss striker was the subject of sustained criticism from manager Neil Lennon over his work rate last month, with the Northern Irishman branding the 23-year-old “sloppy” after the 1-1 draw with Livingston. Kamberi missed a second-half penalty as Hibs had to rely on a goal from defender Ryan Porteous to get a point from the game. After the match, Lennon said: “I don’t know if it’s a confidence thing or a lack of application, but he’s nowhere near as hungry as he was last season. He needs to find that hunger again because he’s an important player for us. “The penalty sums him up at the minute, he’s sloppy. His all-round game at the minute is just not there. “He’s had plenty of opportunities to turn things around but even on Saturday I asked him to put 90 minutes of work into 45 and told him we’d win the game. But former the Grasshoppers striker insists playing with an injury curtailed the early-season form that saw him hit eight goals in 14 games, including a hat-trick against NSI Runavik in the Europa League, and a last-minute winner against Greek side Asteras Tripolis at Easter Road. Kamberi said: “I had a very good start to the season, got a hat-trick in the Europa League, and played for four to six weeks with a knee injury. He insisted that he could have refused to play as a result of the injury, adding: “I could have said, ‘I have fluid on my knee, I can’t play - but I’m not that type. I always give 120 per cent. 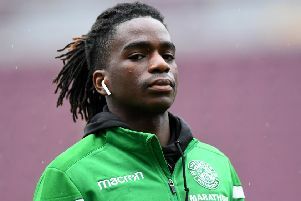 Kamberi is expected to start up front for Hibs on Saturday when they welcome Elgin City to Easter Road in the fourth round of the Scottish Cup.